Dale Stovall was born on February 19, 1944, in Yakima, Washington. He enlisted in the U.S. Air Force Reserve on June 15, 1962, and served on active duty to attend the U.S. Air Force Academy Preparatory School from July 18, 1962, to May 21, 1963. He entered the U.S. Air Force Academy on june 24, 1963, and was commissioned a 2d Lt in the U.S. Air Force on June 7, 1967. Lt Stovall next completed Undergraduate Pilot Training, receiving his pilot wings at Reese AFB, Texas, in October 1968, followed by service as a C-141 Starlifter pilot with the 8th Military Airlift Squadron at McChord AFB, Washington, from November 1968 to April 1970. He then completed helicopter conversion training at Sheppard AFB, Texas, in August 1970, and served as an HH-53 Super Jolly Green Giant pilot with the 44th Aerospace Rescue and Recovery Squadron (ARRS) at Patrick AFB, Florida, from September 1970 to January 1972. His next assignment was as an HH-53 pilot with the 40th ARRS at Nakhon Phanom Royal Thai AFB, Thailand, from January to December 1972, followed by service on the staff of Headquarters Aerospace Rescue and Recovery Service at Scott AFB, Illinois, from December 1972 to August 1975. After completing Air Command & Staff College at Maxwell AFB, Alabama, Maj Stovall served as Commander of Detachment 9, of the 67th ARRS, 39th Aerospace Rescue and Recovery Wing (ARRW) at Zaragoza AB, Spain, from September 1976 to July 1979. He next attended National War College at Fort McNair, Washington, D.C., from July 1979 to June 1980, and then served on the staff at Headquarters U.S. Air Force in the Pentagon from June 1980 to August 1983. Col Stovall completed an Air Force Institute of Technology assignment as a Military Fellow on the Council on Foreign Relations in New York City from September 1983 to May 1984, and then served as Assistant Deputy Commander for Operations and then Deputy Commander for Operations of the 438th Military Airlift Wing at McGuire AFB, New Jersey, from May 1984 to August 1986. His next assignment was as Vice Commander of the 1st Special Operations Wing (SOW) at Hurlburt Field, Florida, from August 1986 to July 1987, and then as Commander of the 1st SOW from July 1987 to July 1989, followed by service as Deputy Director of Plans, Policy, and Doctrine with U.S. Special Operations Command at MacDill AFB, Florida, from July 1989 to February 1990. Gen Stovall served as Vice Commander of 23rd Air Force at Hurlburt Field from February to May 1990, and then as Vice Commander of Air Force Special Operations Command when 23rd Air Force was redesignated from May 1990 until his retirement from the Air Force on June 1, 1993. 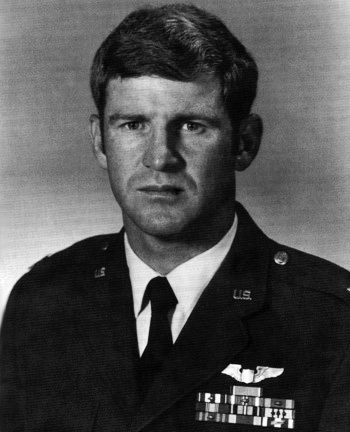 The President of the United States of America, authorized by Section 8742, Title 10, United States Code, awards the Air Force Cross to Captain Dale E. Stovall for extraordinary heroism in military operations against an opposing armed force as an Aircraft Commander of an HH-53C rescue helicopter in Southeast Asia from 1 June 1972 to 2 June 1972. During this period Captain Stovall, voluntarily and at great risk to his own life, repeatedly penetrated an extremely hostile and heavily defended area to effect the rescue of a downed American airman. Captain Stovall's first attempt to rescue the airman was thwarted by numerous hostile aircraft and missiles being directed at the rescue force. Determined to save this airman, he willingly returned to this high threat area, braving intense ground fire, to recover the downed airman from deep in North Vietnam. Through his extraordinary heroism, superb airmanship, and aggressiveness in the face of the enemy, Captain Stovall reflected the highest credit upon himself and the United States Air Force.